Photos of the tombstones for Robert and 2nd Wife Sarah were in the previous post. As stated in an earlier post, Robert’s family is well documented by his family bible (the transcript is available online), but it’s also well covered in the piece about the Beatty Cemetery, which appears in the Beatty 2000 Project Notebook. I have provided a link so you can read the full article. We’ll take Robert’s children in order of their birth. Oldest son Andrew Beatty (20 Nov 1825 – 27 Jun 1894). Andrew moved west with his father and is buried in the Beatty Cemetery, Sibley, Minnesota. He never married and had no children. 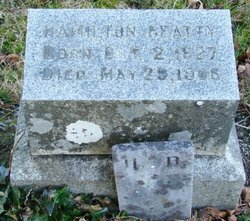 Second son Hamilton Beatty (28 Oct 1827 – 29 May 1906). He moved to Minnesota with his family, but returned to Pennsylvania to marry Sarah “Sallie” Speedy 8 Apr 1869. They returned to Sibley for a good number of years and he was even Treasurer of Sibley County. He migrated to Oregon and died in Salem, Marion County in 1905. He is buried in the Salem Pioneer Cemetery. 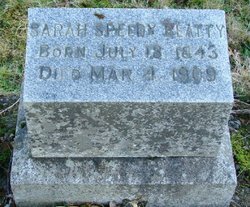 He and Sallie had two children: Harry and Mattie F.
Hamilton’s wife Sarah “Sallie” Speedy Beatty (18 Jul 1843 – 4 Mar 1909) is buried next to him in Salem. Robert and Nancy’s third son Robert Beatty, Jr. (2 Oct 1829 – 6 Sep 1858) moved to Minnesota with his family. He never married and had no children. He is buried in the Beatty Cemetery in Sibley County. 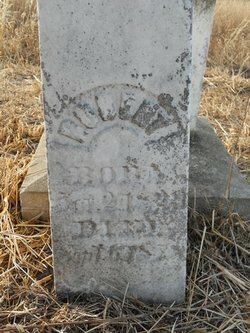 Daughter Letitia Kimmel Beatty (5 Nov 1831 – 31 May 1833) died in Indiana County, as did her younger sister, also named Letitia (28 Sep 1833 – 20 Aug 1844). Both were named for Robert’s sister. Their burial location is not known. 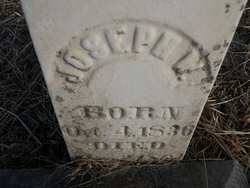 Son Joseph Wilson Beatty (4 Oct 1836 – 2 Apr 1863) did not marry and had no children. He is buried in the Beatty Cemetery. Son William Anthony Beatty (13 Jul 1839 – 29 May 1859) did not marry and had no children. He is buried in the Beatty Cemetery. Son Samuel Bothel Beatty (15 Nov 1841 – 27 Sep 1921) He served in the Minnesota 10th Infantry Regiment during the Civil War. After the war he married Katherine R. Storey (Oct 1842 – 5 Jun 1920) in 1867. I am not sure whether they married in Sibley or if like his brother he returned to Pennsylvania to marry. He and Katherine had four children: Lulu N., Gertrude D., Cora M., and Horace Durward. Samuel is buried in Oak Grove Cemetery, McLeod, Minnesota. I have requested a photo of the stones for he and Katherine, but do not yet have them. Son John James Beatty (22 Apr 1844 – 14 Apr 1845) named for Robert’s youngest brother, born and died in Indiana County, Pennsylvania. Burial location unknown. Nancy Jane Beatty (3 Oct 1848 – 4 Feb 1862) was the youngest child of Robert and Nancy Wilson Beatty. 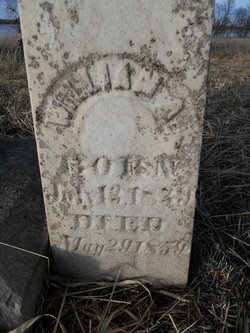 She died at the age of 13 and is buried in the Beatty Cemetery in Sibley, Minnesota. Robert Beatty and 2nd wife Sarah Robinson were married 2 Dec 1851 in Indiana County, Pennsylvania and had two children – both born in Washington Twp., Indiana County. Son James Robinson Beatty (10 Sep – 1852 – 31 Jan 1945). James married Emily Augusta Maas, 20 Feb 1880 in Sibley County, Minnesota. He and Emily had nine children: Sarah Mable, Clark Andrew, Robert William, Nellie Maud, Martha Florence, Grover Cleveland, Gertrude Maria, Grace Irene, and Allen Lloyd. Clark Andrew and Grace Irene are buried in the Beatty Cemetery with their grandparents. James is buried in St. Paul’s Lutheran Cemetery in Gaylord, Sibley County. James Robinson’s wife, Emily Augusts Maas (16 Oct 1857 – 9 Aug 1940) was born in Germany and arrived in about 1865. She is buried in St Paul’s Lutheran Cemetery in Gaylord with James. George Washington Beatty (5 May 1855 – 22 Jan 1890) is the last of Robert’s children. The family bible states he died in Rich Hill, Livington, Missouri. There is no record of a marriage in the bible, and I have not yet located any records concerning his death or the location of his burial. If anyone has knowledge of George Washington Beatty’s burial location, please let me know. The next post will be tombstone photos for James and Rebecca’s children family. Photos courtesy of the Sibley County Historical Society and other contributors on Find A Grave. Moving back a generation from Rebecca Beatty to her parents Andrew and Sarah “Sally” (Unknown) Beatty. 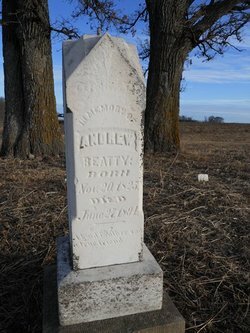 History Of Pioneer Family Chronicled At Rural Gravesite Article published in “THE LAND” Friday, Dec. 5, 1986, Gaylord, Minn., This article is about Andrew’s oldest son Robert Beatty. Andrew’s daughter Rebecca consistently reported her place of birth as Ireland, but son John James Beatty, born about 1827, consistently listed his place of birth as Pennsylvania. Andrew appears on the 1830 and 1840 censuses in Armstrong Township, Indiana County, Pennsylvania.3,4 In both cases, he is residing next to his son Robert. There are multiple other Beatty families on these pages; however, while it is believed they are related, the exact relationship is not yet known. The 1850 and 1860 census finds Andrew and family relocated to Washington Township, Indiana County.5,6 In 1850, Andrew is living beside his married son William and married daughter Rebecca. In 1860, Andrew is living beside his married son John J. and near married son William. Sarah (Sally) Unknown (abt 1779 – 15 Mar 1874) Sally is buried beside daughter Nancy J. Beatty with a stone that matches Nancy’s and Andrew’s. Letitia (27 Feb 1806 – 4 Jul 1895) m. Andrew Kimmel (11 May 1803 – 24 Aug 1879) Letitia and Andrew had no children. She and Andrew are buried in the Elderton United Methodist Church Cemetery. Margaret (abt 1810 – 24 Feb 1878) Some trees note a marriage to John Moore; however, I found no evidence that Margaret married. She is found on each of the named censuses 1850, 60, and 70, under her maiden name and her tombstone is also with the name Beatty. There is also a 1 Jul 1850 christening record at the Plumcreek Presbyterian Church for a child named Charlotte, daughter of Margarette [sic] Beatty.10 No other record for the child is found. The only Beattys recorded in this church are the Beattys of this family group. Nancy J. (abt 1816 – 6 May 1893) never married. Her will names her sister Rebecca and her brother Robert along with several of her nieces and nephews. A scan of the original and a transcript is provided. William Beatty (abt 1818 – 1 Jul 1865) m. Sarah Lewis (abt 1831 – 19 Apr 1904) no children. 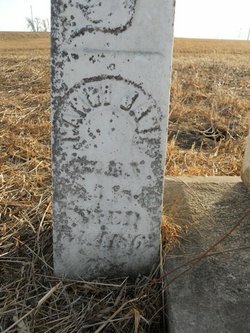 John James (Sep 1826 – 2 Apr 1906) m. Letitia H. Smith (16 Jan 1831 – 6 Jan 1896) John and family removed to Clay County, Kansas, after the Civil War, where he remained for the rest of his life. John and Letitia are buried in the Greenwood Cemetery in Clay Center, Clay, Kansas. I have provided family group sheets for Robert and John James. Brothers William and John James both served in the Civil War. A note about the Beatty line. There is an excellent source of information on Rootsweb (and now on Ancestry) called the Beatty 2000 project. This follows the lines of multiple Beatty families and attempts to connect them by documentation and now by DNA. This particular line is Lineage #84. The other Beatty line in Indiana and Armstrong counties is Lineage #82. It is believed that Andrew is the son of the John Beatty (#82) which leads that line, but no documentation has been found. DNA research is now being conducted. My next post will be Beatty tombstone photos and then I will move on to the Shaffer line. Peter Shaffer was the husband of Nancy M.J. Beatty. 1. Family pages only; photocopy held by, n.d; Rootsweb.ancestry (http://homepages.rootsweb.ancestry.com : accessed 20 Feb 2010), Robert Beatty Family Bible. 2. The Land (Gaylord, Minnesota: n.p., Dec 1986), Beatty Cemetery, Sibley County, Minn. History Of Pioneer Family Chronicled At Rural Gravesite. 3. 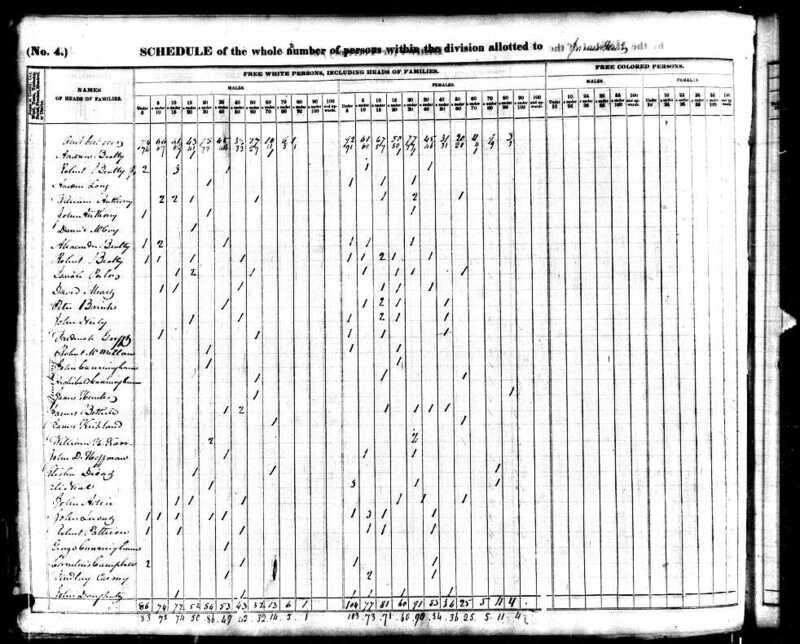 1830 U.S. census, Indiana, Pennsylvania, Armstrong Twp., p. 197, line 4, Andrew Beatty; digital images, Ancesty (http://www.ancestry.com : accessed 25 Dec 2011); citing National Archives and Records Administration microfilm M19, roll 152. 4. 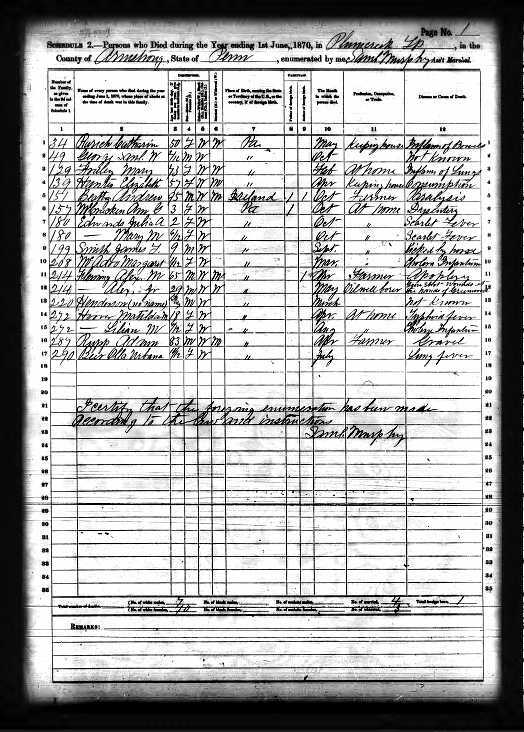 1840 U.S. census, Indiana, Pennsylvania, Armstrong Twp., p. 104, line 1, Andrew Beatty; digital images, Ancestry (http://www.ancestry.com : accessed 25 Dec 2011); citing National Archives and Records Administration microfilm M704, roll 463. 5. 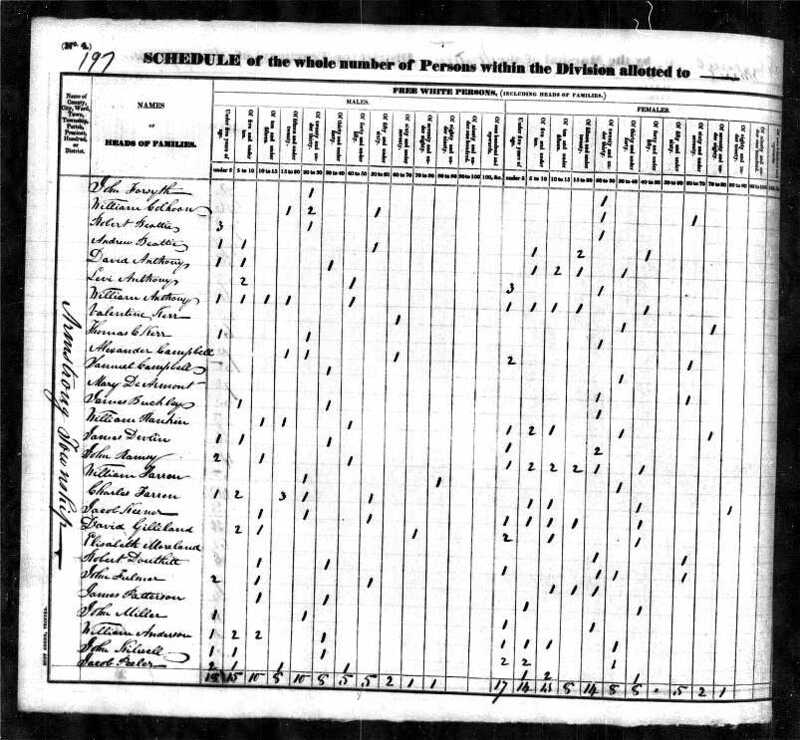 1850 U.S. census, Indiana, Pennsylvania, population schedule, Washington Twp., p. 220B, dwelling 140, family 140, Andrew Baty; digital images, Ancestry (http//www.ancestry.com : accessed 22 Dec 2011); citing National Archives and Records Administration microfilm M432, roll 785. 6. 1860 U.S. census, Indiana, Pennsylvania, population schedule, Washington Twp., p. 353, dwelling 2038, family 2010, Andrew Beatty; digital images, Ancestry (htt://www.ancestry.com : accessed 25 Dec 2011); citing National Archives and Records Administration microfilm M653, roll 1117. 7. 1870 U.S. Census Mortality Schedule of Pennsylvania, Armstrong County, Plumcreek Twp., p. 1, line 5, Andrew Beatty, age 95, Oct, paralysis; digital images, Ancestry (http://www.ancestry.com : accessed 23 Dec 2011); citing National Archives and Records Administration Archive Collection M1838; Archive Roll Number 5. 8. Armstrong, Pennsylvania, 5: 144, Estate 5250, Nancy Beatty, 1 Jun 1893. 9. Family pages only; photocopy held by, n.d; Rootsweb.ancestry (http://homepages.rootsweb.ancestry.com : accessed 20 Feb 2010), Robert Beatty Family Bible. 10. 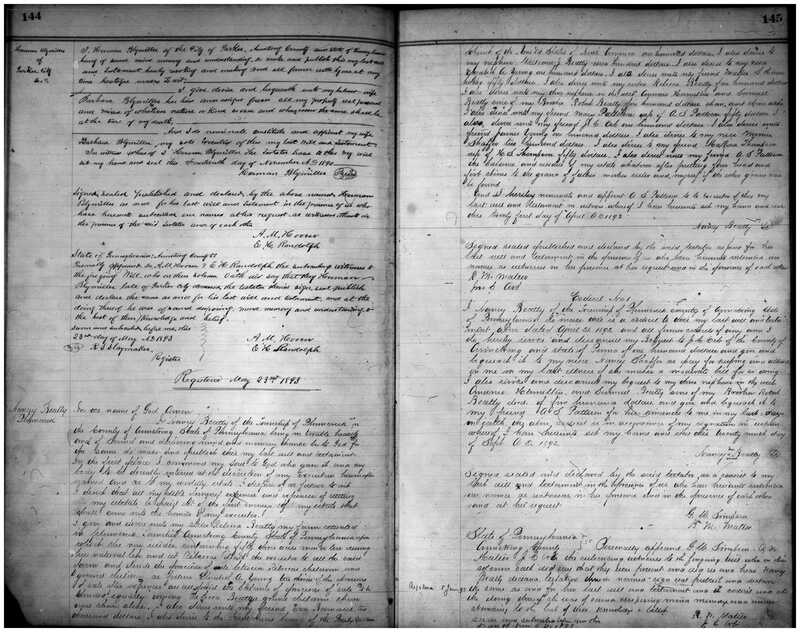 Treasures of the Past, “Plumcreek Presbyterian Church Baptism Records,” database, Ancestry (http://www.ancestry.com : accessed 6 Jun 2011), Beatty, Charlotte, baptized 1 Jul 1850. One of the first things I did when I started this line was order the death certificate for Ike.1 It provided the documentation I needed for his familial ties, but it also led to some questions. More on that later. 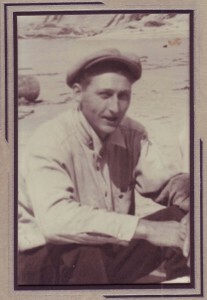 He was born 22 October 1908 to Jan (John) Burggraaf and Maria (Mary) Kortlever in Lynden, Whatcom County Washington. Ancestry has the Washington Births, 1907-1919,6 database available and this provides more documentation of his actual birth date and his mother’s name of Maria Kortlever. Ike married Dorothy Josephine Johnson on 3 August 1927 in Bellingham, Whatcom County, Washington.7 Her mother, Lucy Jane Wilson Johnson was one of the witnesses. He was buried in Monumenta Cemetery in Lynden, Whatcom County, Washington, where he shares a tombstone with his brother Bert. 1. Oregon State Health Division Center for Health Statistics, death certificate #340 (28 Apr 1939), Arie Burgraff; Oregon State Health Division, Portland, Oregon. 2. 1910 U.S. census, Whatcom County, Washington, population schedule, Lynden, enumeration district (ED) 351, p. 9A, dwelling 181, family 181, Arie Burgraff; digital images, Ancestry (http://www.ancestry.com : accessed 22 Jun 2009); citing National Archives and Records Administration microfilm T624, roll 1674. 3. 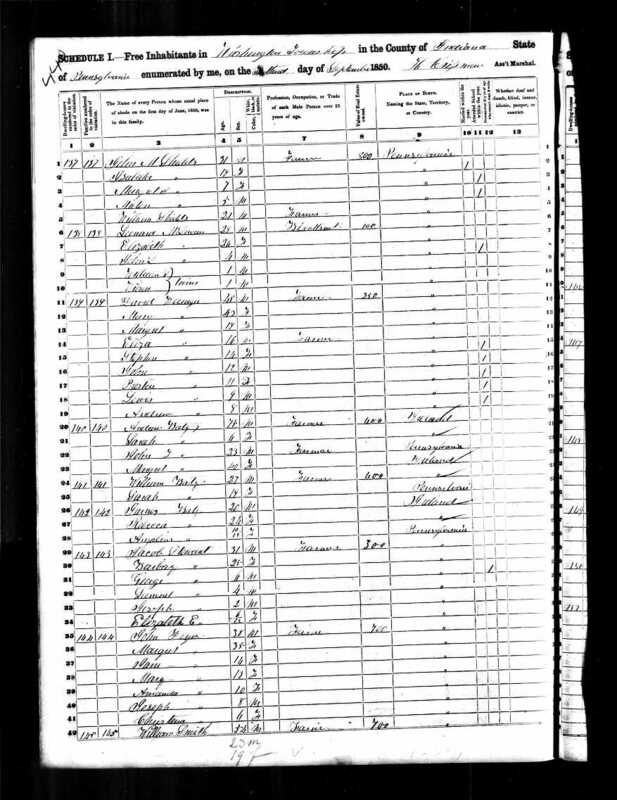 1920 U.S. census, Whatcom, Washington, population schedule, Lynden, enumeration district (ED) 258, sheet 341, p. 21A, dwelling 28, family 28, Arie Burgraff; digital images, Ancestry (www.Ancestry.com : accessed 22 Jun 2009); citing National Archives and Records Administration microfilm T625, roll 1944. 4. 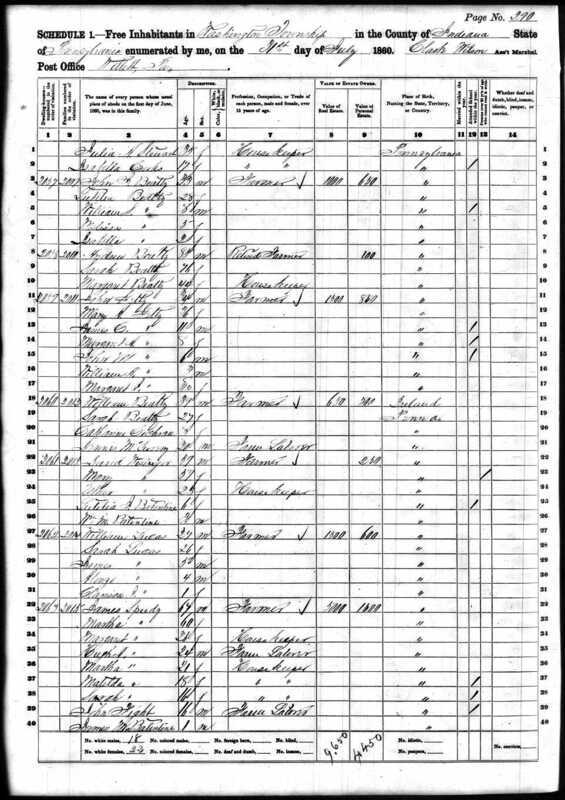 1930 U.S. census, Jackson County, Oregon, population schedule, Jacksonville, enumeration district (ED) 31, sheet 4A, p. 7, dwelling 89, family 91, Arie Burgraff; digital images, Ancestry (www. Ancestry.com : accessed 1 Jul 2009); citing National Archives and Records Administration microfilm T626, roll 1944. 5. State of Oregon, “Oregon Death Index, 1903-1998,” database, Ancestry (http://www.ancestry.com : accessed 1 Jul 2009), Arie Burgraff, Certificate 340; Oregon Death Index, 1903-98. 6. Washington State Department of Health, “Washington Births, 1907-1919,” database, Ancestry (http://www.ancestry.com : accessed 15 Jan 2010), Burgraff, 22 Oct 1908. 7. Whatcom County, Washington, Marriage Licenses, 3 Aug 1927, Arie Burgraff-Dorothy Johnson, 1927; Whatcom County Marriage Records, Bellingham.